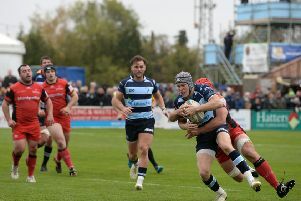 Bedford Blues will be looking to start 2015 in the best possible fashion when they make the trip to Moseley on Saturday afternoon. While 2014 was certainly a mixed year for the Blues, they will be looking to build on recent performances when they visit Billesley Common for a crunch encounter with Mose. Although Bedford slipped to a 24-28 defeat against league leaders Bristol on Boxing Day, there were clear signs that the Blues had rediscovered some of the form that had made them so dangerous in previous seasons. “I was really impressed with our display last Friday,” said Blues Team Manager Rob Crowle. “The forwards really fronted up against a big Bristol pack, the backs were brilliant in defence and attack, managed to score four tries to secure two bonus points and caused them some real problems. Bedford make a handful of changes from the side that ran Bristol close with Ollie Dodge starting at inside centre in place of Viliami Hakalo while James Currie and Mike Howard come in for Phil Boulton and Ben Gulliver respectively. There is also a place on the bench for London Irish prop Johnny Harris who has re-joined the Blues on loan. Blues: 15. James Pritchard (C); 14. Pat Tapley; 13. Mike Le Bourgeois; 12. Ollie Dodge; 11. Dean Adamson; 10. Jake Sharp; 9. Darryl Veenendaal; 1. Tom Williams; 2. Charlie Clare; 3. James Currie; 4. Mike Howard; 5. Harry Wells; 6. Justin Blanchet; 7. Josh Buggea; 8. Paul Tupai. Replacements: 16. TJ Harris; 17. Johnny Harris; 18. Phil Boulton; 19. Ben Gulliver; 20. Joe Vandermolen; 21. Peter White; 22. Henry Staff.